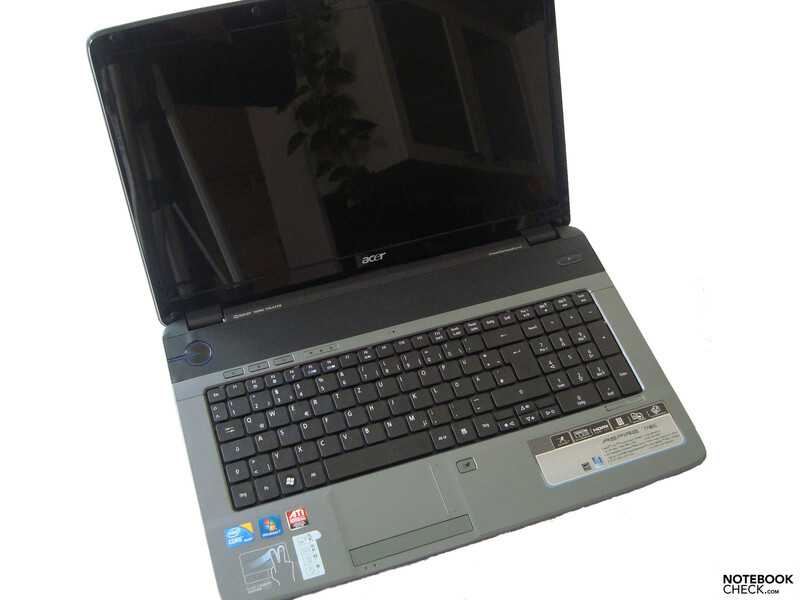 Core i5 430M CPU (2,26GHz, 1066 MHz FSB) with Turbo Boost Feature, ATI Mobility Radeon HD 5470, four GB DDR3 RAM, 640 GB hard drive and a 17,3 inch HD LED display – all this is combined in our reviewed notebook, the Aspire 7740G by Acer. We only recently had the 15.6 inch Aspire 5740G for review, so its now the turn of the Aspire 7740G to prove whether it can keep up with its smaller brother or not. Except for the size of the case and a few other details, both of the models are very similar, particularly with regard to the included hardware. The visual appearance also provides obvious clues that these two notebooks are related. The most striking difference between the two is the 17.3 inch display on the Aspire 7740G, with a maximum resolution of 1600x900 pixels. Looking at the manufacturers website (German), there are currently a total of six different configurations for the Aspire 7740G in Germany. Our reviewed notebook is the Aspire 7740G-434G64Mn. On the contrary, Acer lists only one 7740 configuration on its UK website and offers three 7740G models in the US at the time of writing. 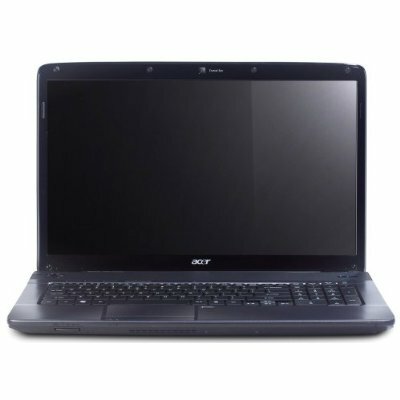 As with the case of the 5740G, the case of the 17.3 inch Aspire 7740G is also made of plastics, and is highly robust and stable. Thus the hand resting area, as well as the area between the keyboard and display are very firm and do not give way to pressure. The exception to this, once again, is the area behind the display. Particularly the area around the Acer logo shows clear signs of yielding to light pressure. Another weak point is the bottom of the base unit around the optical drive, which also yields to pressure easily. Lifting the notebook on one side of the base unit does not however cause any of the plastic case to warp. 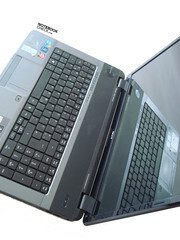 The 17.3 inch display is held in place by two hinges on the left and right sides. Contrary to its smaller brother, the 7740G makes due without a latching closed mechanism. 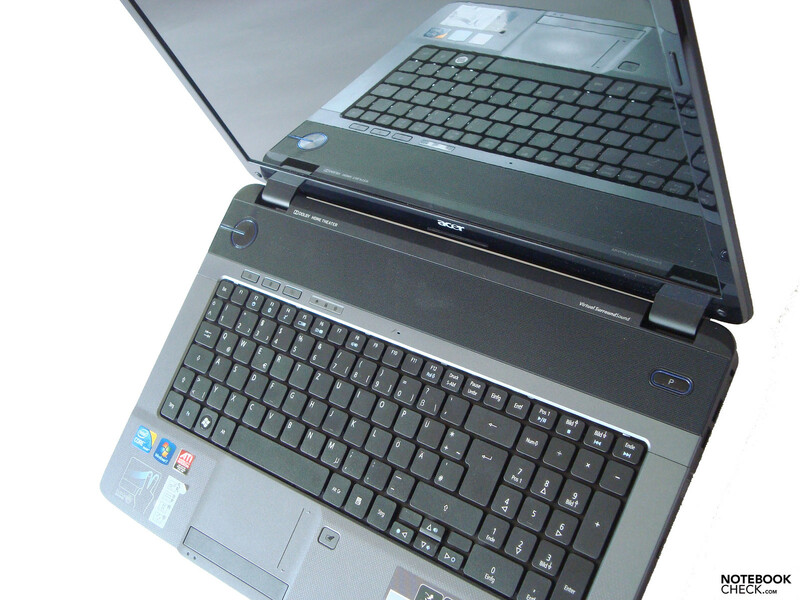 The display nevertheless stays closed, although care should be taken when transporting the notebook, so that the display is not exposed to damage. Small objects could get in between the display and the top of the base unit, and potentially lead to scratches. A transport bag or sleeve is definitely to be recommended in this case, not just for the reason already mentioned, but also because of the glossy blue and reflective back of the display lid. The same glossy blue reflective surface is found on the display frame, which makes for a more attractive appearance, but only as long as the surface remains free of finger prints. Thus these surfaces are very care intensive. The hand resting area is kept in a dark gray, as is the Touchpad, which optically fits very well to the rest of the design of the notebook. One negative aspect, which already came to our attention on the Aspire 5740G, is that we found the maximum opening angle of the display to be a little too small. For normal use this should however not pose any problems. Unfortunately the Aspire 7740G not only inherited the strengths of the Aspire 5740G, but also the weaknesses. 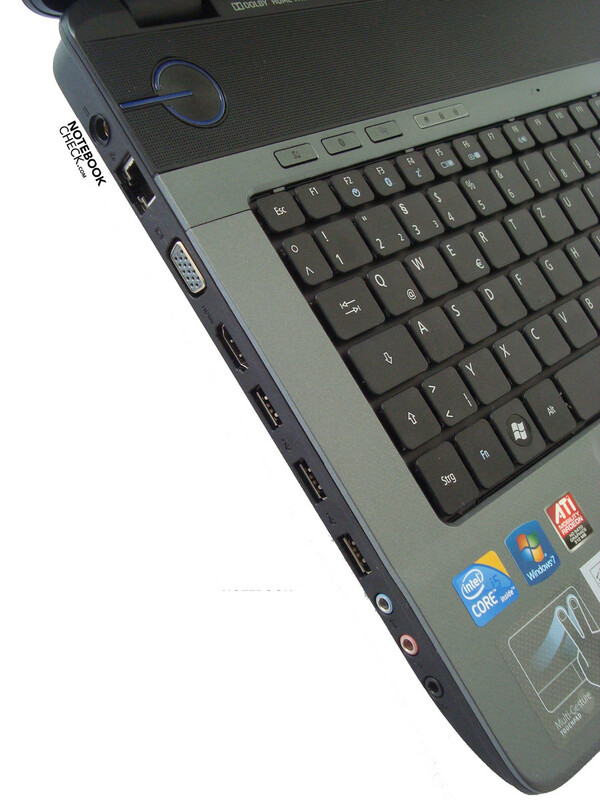 So once again the majority of the important connection interfaces are located on the left side of the notebook. There are the power connector, LAN, analog VGA output, HDMI port, three USB ports, and three audio interfaces (microphone, headphone, and SPDIF). Having multiple tangled cables is therefore almost unavoidable; should the user wish to have the power cable connected, as well as using the LAN interface, and possibly using an external monitor, while listening to the audio with a stereo system. 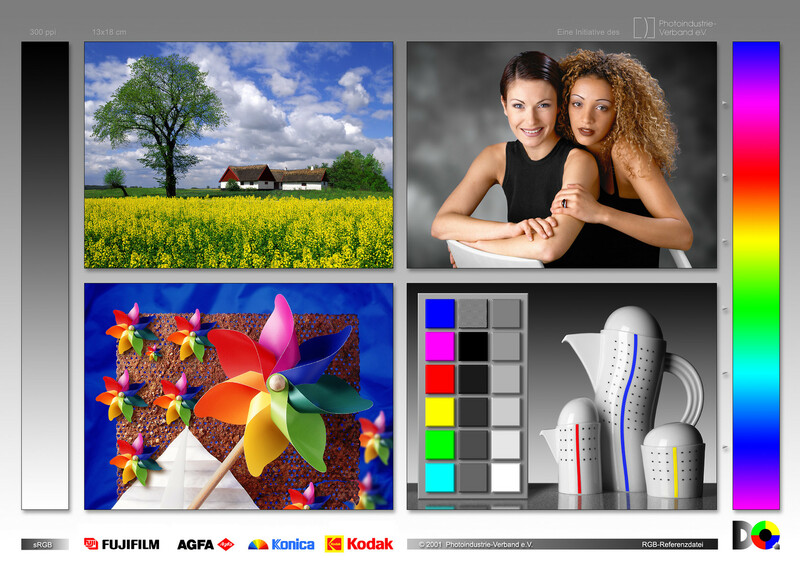 All this without even using a mouse, printer, digital camera or similar devices. The right side is very empty / tidy in comparison. 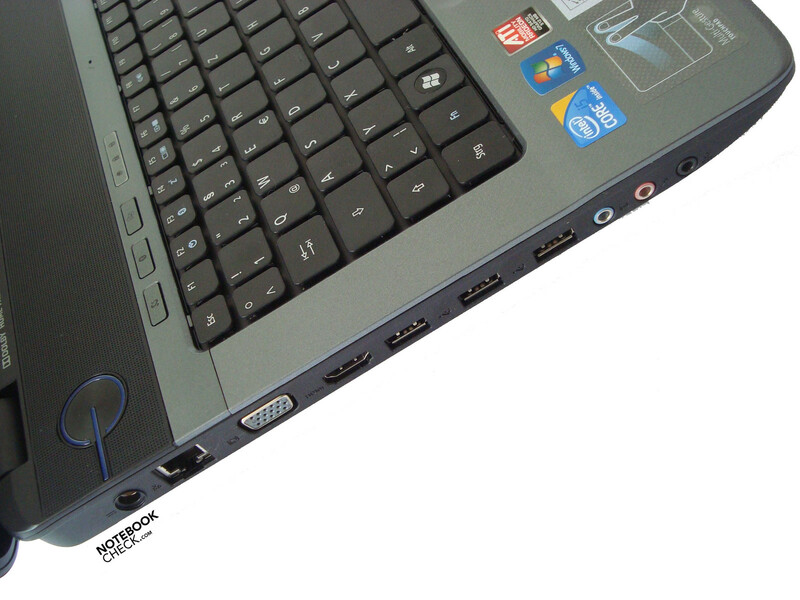 There is only the optical drive, the modem port, the fourth USB port, and the hole for attaching to a Kensington Lock. The front merely has a multi-in-1 card reader (supports Secure Digital (SD) Card, MultiMediaCard (MMC), Memory Stick (MS), Memory Stick Pro (MS PRO), xD-Picture Card (xD)), and a ventilation opening. The back of the Aspire 7740G is not much more spectacular, which merely has a ventilation opening. 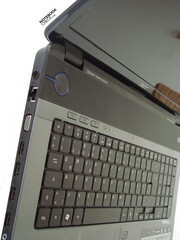 Furthermore the Aspire 7740G offers a Crystal Eye webcam, and an array microphone which is located above the F10 key. Thus there is not much standing in the way of video conferencing with this review candidate. For communications the Aspire 7740G has the tried and tested cabled variant, in the form of a LAN port (Broadcom NetLink Gigabit Ethernet) available as an option. In addition it has an integrated WLAN module by Atheros; type AR5B93 Wireless Network Adapter, with which it is also possible to make a wireless connection to the internet. Also included is a modem port (LSI HDA modem), even if this is hardly of use nowadays. The Aspire 7740G also has the same type of keyboard, which already made a good impression on us optically as well as haptically, when we reviewed the Aspire 5740G. For this reason it wasn't difficult for the Aspire 7740G to follow in the footsteps of its smaller brother. In between the individual keys once again there is a two millimeter gap through which dust and dirt can get under the keys, which is not something that any reasonably good vacuum cleaner can't come to terms with though. Not considering the optical appearance, users with wide fingers will also be happy not to accidentally press adjacent keys. Getting used to using this keyboard is unlikely to take a long time, since all the keys can be found where they would be expected to be, as they would be on a standard desktop keyboard. The keyboard does not bend when subjected to localized pressure, and the sound generated by energetic typing is held within limits. 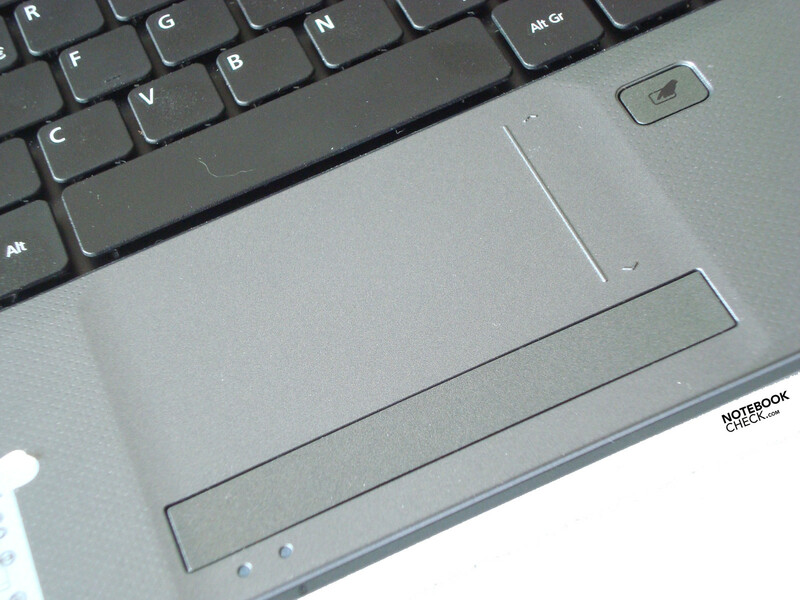 The pressure point is, again as on the Aspire 5740G, clear and easily recognizable. As should be expected from a 17 inch notebook, there is also a complete alphanumeric keypad on board. Altogether it is safe to say that the keyboard provides a good feeling when typing. As a mouse-replacement, and just as on the Aspire 5740G, a multi-gesture Touchpad comes into use, with which it is possible to zoom in and out using the appropriate gestures. Exactly the same as for the turning of pictures, and the scrolling up and down when surfing the web or reading text documents. All these features work wonderfully once you get the hang of it, but whether they are really very beneficial for daily work use is still a little questionable. As for the actual function of the Touchpad as a replacement for the mouse, unfortunately we had to observe occasional small lapses from time to time, meaning that the mouse pointer failed to react properly to our fingers movements. 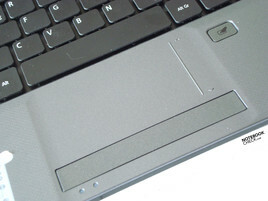 A long bar also provides the mouse replacement buttons in this case, which can be found directly below the touch sensitive surface of the Touchpad. It is possible to deactivate the Touchpad at any time using a button. Particularly when attaching an external mouse to the notebook this is to be recommended. The Aspire 7740G is equipped with a large 17.3 inch display, which has a relatively reflective surface. Although the colors are more vibrant as a result, this comes at the cost of less versatility in terms of the possible working environments, such as outdoors and in areas where the lighting conditions are not favorable. 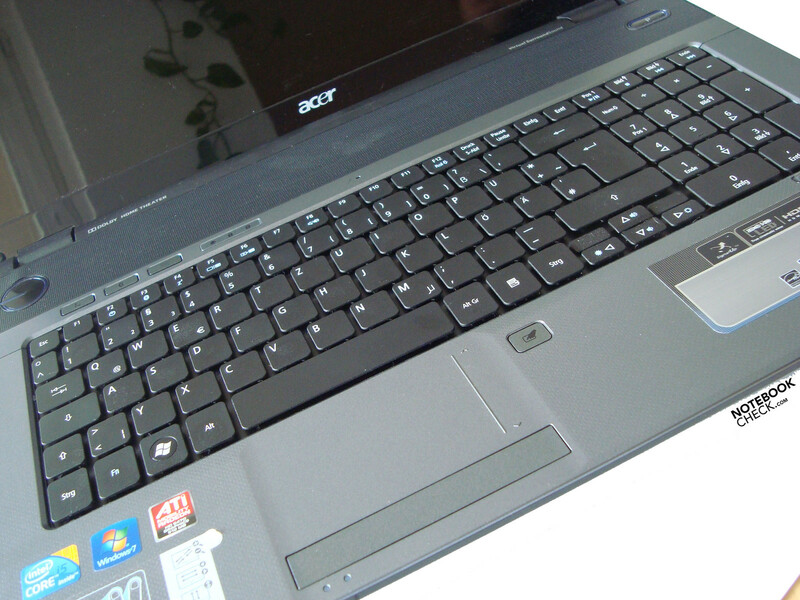 The performance of the glare display, which according to Acer has a reaction time of 8 milliseconds, becomes particularly visible when playing computer games and watching DVDs. As long as the notebook is used indoors or at home, all the reflections stay within acceptable limits. When using the notebook outdoors the reflective surface of the display can lead to considerable problems, whereby the sunlight is reflected too much, so that the images on the display are difficult to see. This is a problem that nearly all glare displays have to contend with. The reason for this is usually that the display brightness is too low. In our opinion the display illumination is also not even enough. The measured values reached from a minimum of 165 cd/m², up to a maximum of 212 cd/m². With an average brightness of 187,9 cd/m², the Aspire 7740G ranks above average. The highest measurement of 212 cd/m² was taken in the middle and bottom right areas. The darkest area was on the left side in the middle. These are at least the values on paper. In practice however these differences are hardly noticeable. Regarding the resolution the 17.3 inch display with an aspect ratio of 16:9 achieves a proud 1600x900 pixels. 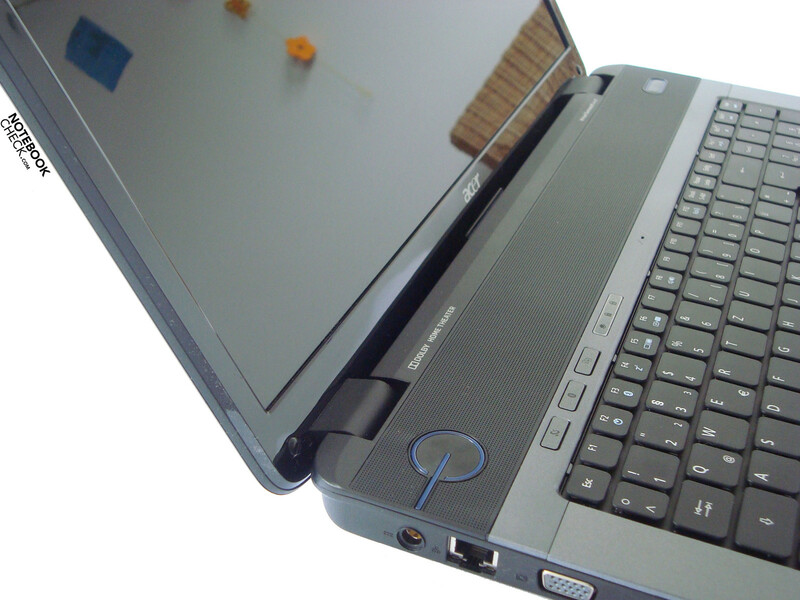 With respect to the viewing angle stability, the display is similar to the 15.6 inch variant on the Aspire 5740G. Thus the horizontal viewing angle is especially vulnerable to changes to the position of the display and the seating position. The vertical viewing angle is significantly more accommodating, which does allow reasonably wide viewing angles. 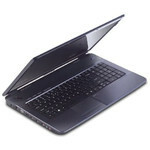 With respect to the performance, the Aspire 7740G should be very similar to the Aspire 5740G. The reason for this are the identical hardware components CPU and GPU, which are chiefly responsible for the benchmark results. Thus our reviewed notebook contains an Intel Core i5 430M with a clock speed of 2.26 GHz, and an ATI Mobility Radeon HD 5470 with 512 MB of GDDR3 RAM. It is therefore not surprising that the results are almost the same, as we will see in the next paragraph. Running 3DMark2001, 3DMark03, 3DMark05 and 3DMark06 on the Aspire 7740G gave results of 22983, 10017, 6843 and 3734 points respectively. 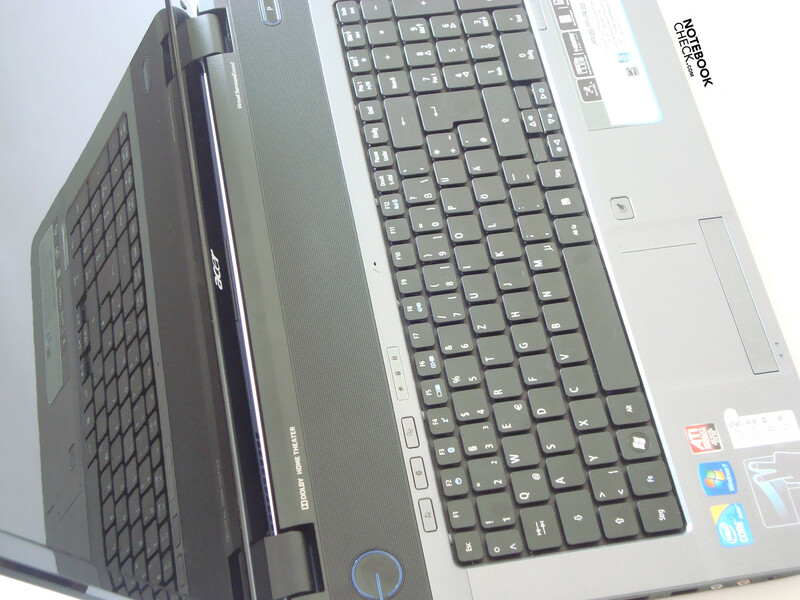 Just for the sake of comparison, the Aspire 5740G had results of 23077, 10045, 6892 and 2611 points respectively. As is easy to see, the results are very similar and hence confirm our expectations. Running the latest FutureMark benchmark, 3DMark Vantage, led to similar results. This benchmark gave a result of 1293 points in the overall ranking for the reviewed notebook, 1016 for the GPU, and 7127 for the CPU. For the sake of comparison, the values for the 5740G: 1195, 935, and 7258 points. The Cinebench benchmark again led to similar results. This gave 3232 points for single core rendering, and 7690 points for multicore rendering, for the Aspire 7740G. For shading, the reviewed candidate scored 3927 points. A reasonable 5.0 score is achieved for the Windows 7 Windows Experience Index. The moderate desktop performance for Windows Aero is responsible for this. 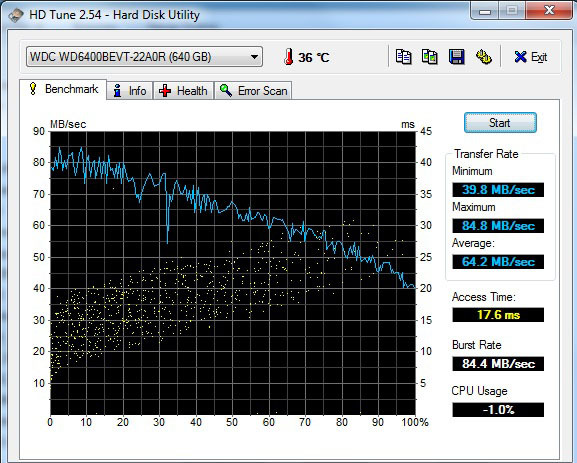 For the mass storage device the Aspire 7740G has a hard drive by Western Digital (WDC WD6400BEVT-22A0RT0), with a total capacity of 640 GB, that operates at a speed of 5400 RPM (Revolutions Per Minute). Thus this should provide ample memory for games, MP3 files, movies, photographs and other similar data. Data transfer rates and data access times are in the average range as expected. 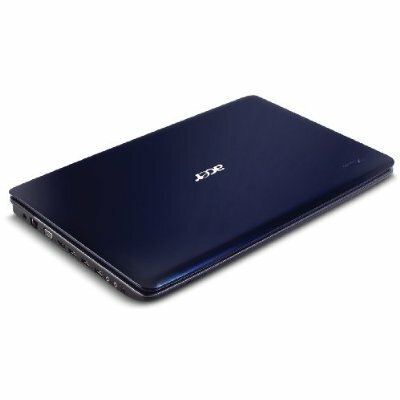 The Acer Aspire 7740G has a Core i5 430M processor, which independently provides over-clocking thanks to the Turbo Boost feature. 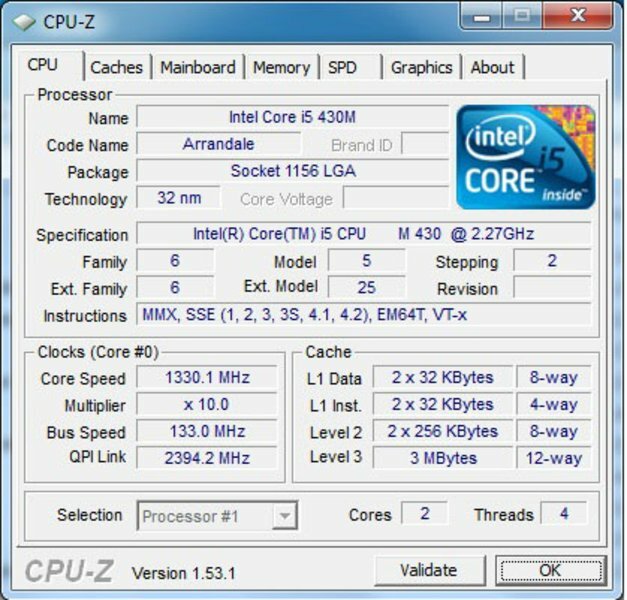 Using this, unnecessary cores are switched off, and utilized cores are automatically over-clocked. 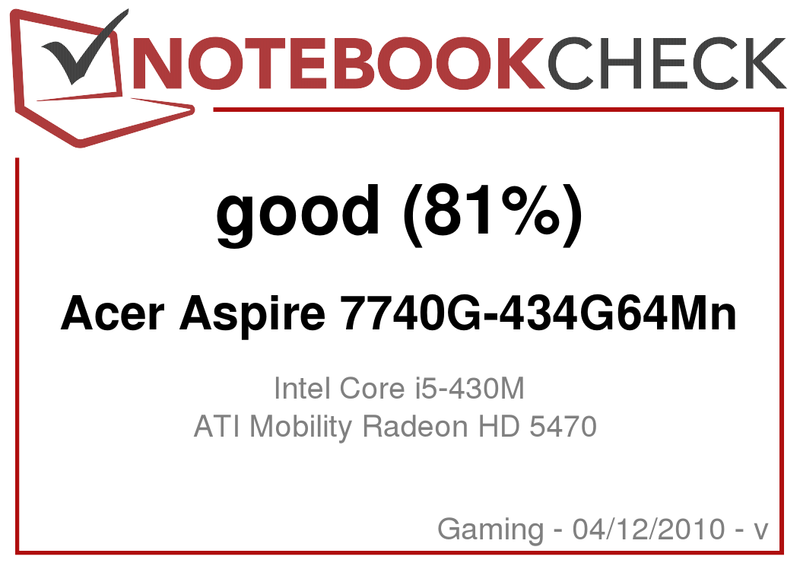 Further to this our reviewed notebook has an average entry level mainstream GPU in the form of an ATI Mobility Radeon HD 5470, with 512 MB of GDDR3 memory. 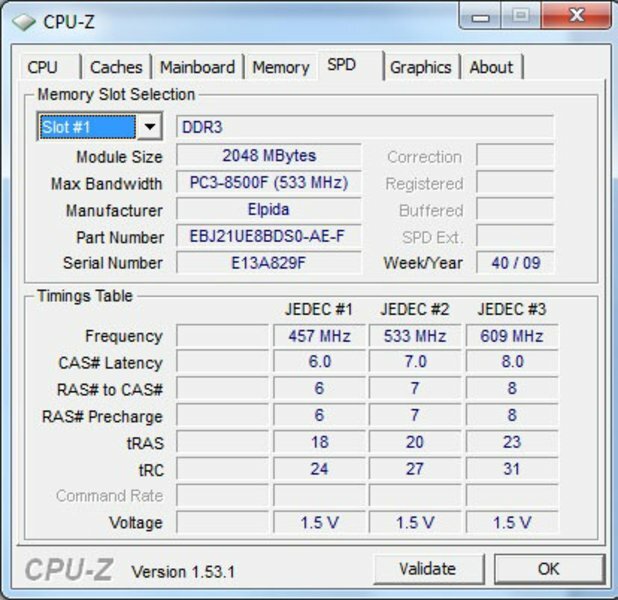 Also relevant for gaming is the included RAM, which has a capacity of four GB, and is made by Elpida. In cases where this is not enough, it is possible to upgrade to up to eight GB. 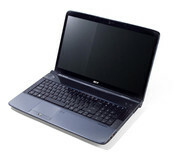 Since most of the important hardware components are identical to those of the Acer Aspire 5740G, it is to be expected that the gaming performance is also very similar - using the same resolution of course. The native resolution of the 7740G at 1600x900 pixels, is somewhat higher than that of the 5740G. We can generally say that the Aspire 7740G can represent all the current games, although the detail level and resolution has to be tweaked down in some cases, to allow having fun with frame rates above 30 FPS. Older games don't pose many problems to the reviewed notebook, and can be played with the detail and resolution settings set higher. 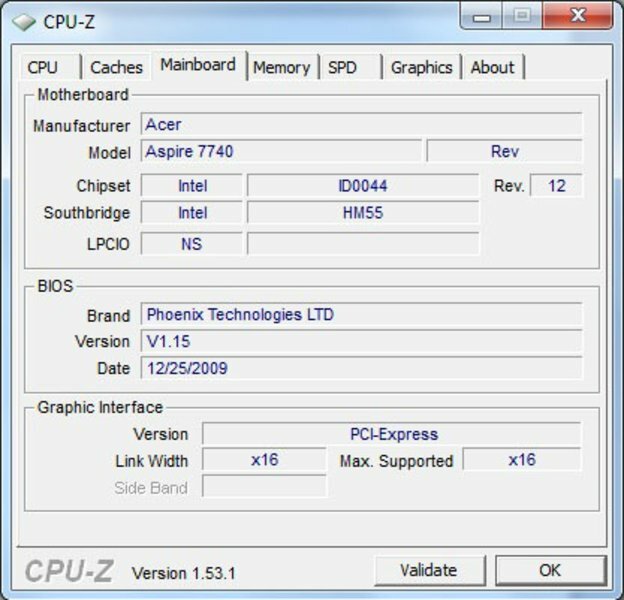 For gaming performance of individual games, the results of the Aspire 5740G can be checked for more elaborate descriptions, which can also be considered valid for the 7740G. The system noise of the Aspire 7740G is definitely in the acceptable domain. Particularly in idle mode, the average volume of 28.5 dB(A) is barely noticeable, which is very pleasing. It is more likely that the internal hard drive will be the primary cause of disturbance, which creates 30.4 dB(A) when accessing data. Occasionally in idle mode, there are short bursts of noise on our measurement device which lead to a reading of 32.5 dB(A), this can however still be classified as quiet and is hardly noticeable under normal conditions. The integrated Optiarc DVD RW AD-7585H optical drive in contrast generates about 35.8 dB(A) of noise when reading DVDs, which is however still in the normal region for optical drives. When running at high utilization, the cooling fan speed is increased in steps generating up to 39.8 dB(A). The average noise level when running at gaming utilization lies at a reasonably pleasant 36.6 dB(A). In combination with relatively low temperature emissions when operating at a high utilization, the Aspire 7740G paints a very good picture - more on this next. As previously mentioned, our reviewed specimen is a very quiet desktop replacement notebook. That such devices do not necessarily have to run hot is proved by the Acer Aspire 7740G. Our tested specimen stays just below the 40° Celsius temperature mark on the upper surface when running at a high utilization level, according to our measurements. We measured the highest temperature of 39.8° Celsius in the upper left corner. This is also the area where the cooling system air is released through a vent at the back. When typing this is hardly noticeable, providing a pleasant temperature for working. All the remaining temperature measurements on the upper side are far below the maximum 39.8° Celsius, and thus well within the acceptable range. On the bottom side the picture is very similar. The hottest point we measured had a temperature of 39.4° Celsius, and this was in the top right corner where the cooling system air vent is located. The rest of the bottom surface stays pleasantly cool, so that working with the notebook on your lap is definitely a comfortable option. 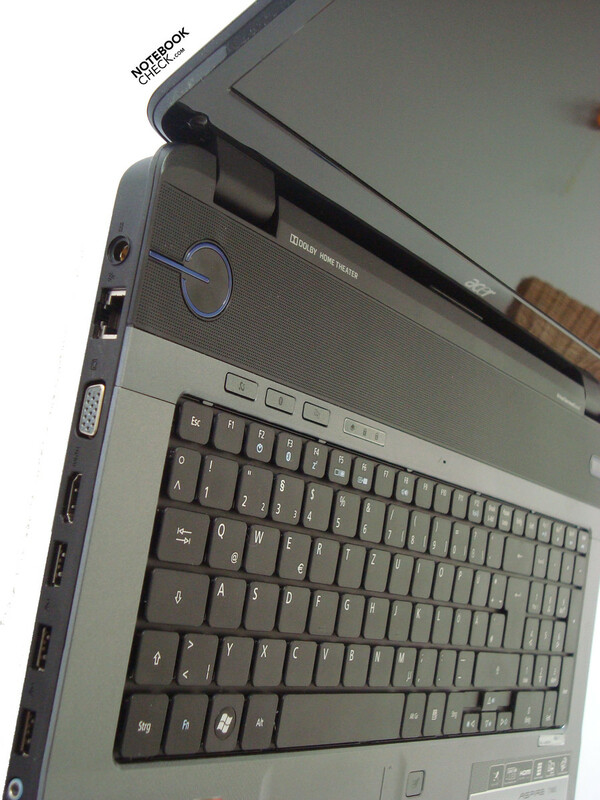 The integrated loudspeakers in the Aspire 7740G are located in the area between the keyboard and display. Responsible for the sound on board is a sound card by Realtek (Intel Ibex Peak PCH - High Definition Audio Controller), which ensures a good soundscape for movies and games - provided an appropriate sound system is used. The right atmosphere is only created using the home stereo system or the right headphones. The integrated loudspeakers may be adequate for every day use in terms of the sound quality and the volume output, but are unlikely to knock anyone out of their seats. The sound system in the Aspire 7740G has the same problems that most other manufacturers and notebooks have in this price range. Depending on the audio, this can often sound very tinny. Low frequency techno songs are particularly bad for listening to, due to the missing sub-woofer. As is the case for most other notebooks with moderately priced loudspeakers, we would recommend using the Aspire 7740G with the home stereo system, or a high quality pair of headphones, in order to circumvent this problem and provide a better listening experience. The Aspire 7740G with its 17.3 inch form factor can definitely be classified as a desktop replacement. But just in case we also examined its mobile suitability for the case of cases. As with the Aspire 5740G, the battery life of the Aspire 7740G can also be described as relatively short when operating at a high level. After only 53 minutes the six cell battery ran out of steam when testing it using the Battery Eater Classic test. The Battery Eater Readers test appears to be better suited to our reviewed notebook. Using this test the Aspire 7740G achieves a battery life of 218 minutes. When surfing the internet using the integrated WLAN module, our notebook achieved an operating time of 142 minutes, which equates to a little room for mobile use. 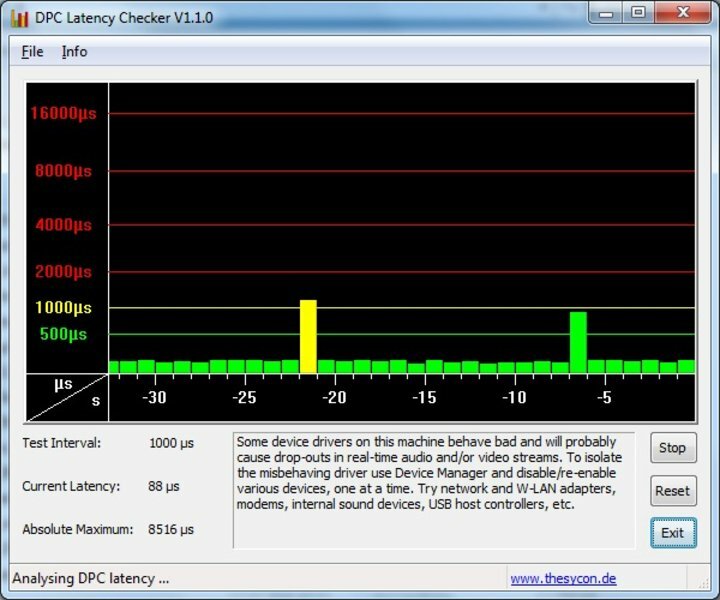 When watching a DVD using the maximum brightness level, the Aspire 7740G achieved an operating time of just under 90 minutes. Reducing the brightness of the display should lead to a battery life of just under two hours before needing to be reconnected to the power socket, and should thus be enough to watch a standard DVD movie. 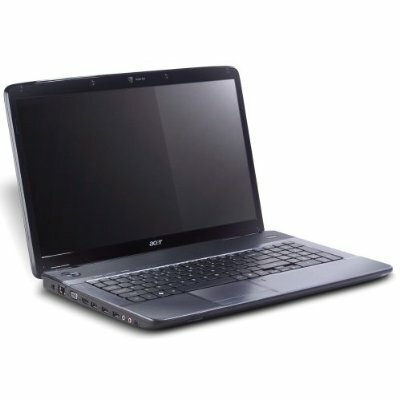 The Aspire 7740G is equipped with a Core i5 430M CPU and a Mobility Radeon HD 5470 GPU, and is a robust and solid desktop replacement notebook in the 17 inch segment. 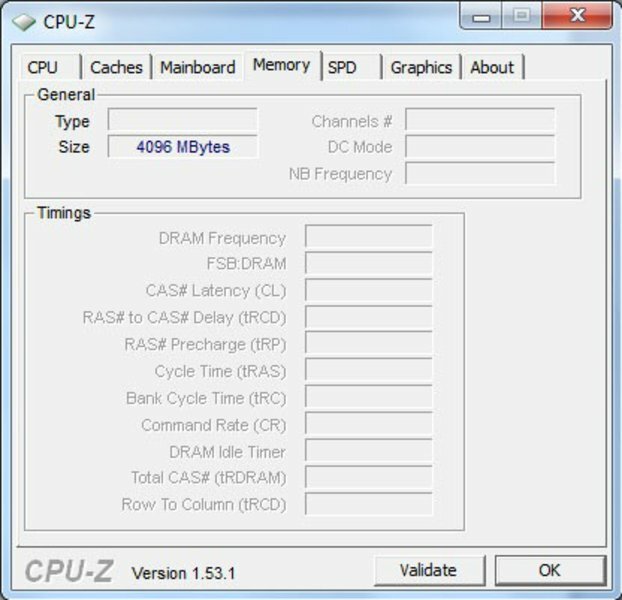 Furthermore our reviewed notebook contains four GB of DDR3 RAM memory, and a 640 GB hard drive that operates at 5400 RPM. With respect to the interfaces, the Aspire 7740G is very generous. There are for example an HDMI port, 4x USB 2.0, a multi-in-1 Card Reader, analog VGA output, modem, LAN, and three audio ports on board. Most of the mainly used interfaces are located along the left side though, so that it is almost inevitable that several cables will get tangled with each other. Another feature worth mentioning is also the multi-gesture touchpad, even if this is generally unlikely to provide any serious advantages in day to day use. Unfortunately we had to observe occasional lapses of response from the touchpad, which did not occur often, but did nevertheless. 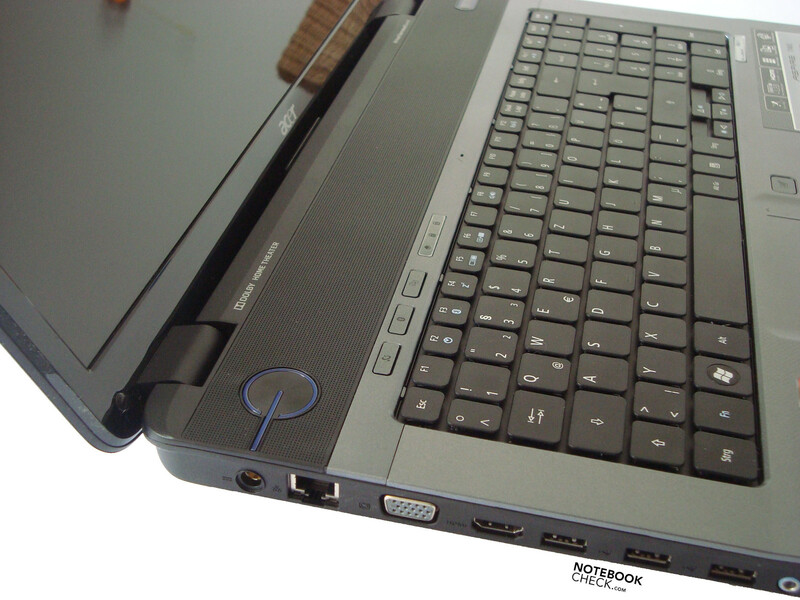 Another positive aspect is the integrated keyboard, which we already praised in the review of the Aspire 5740G. 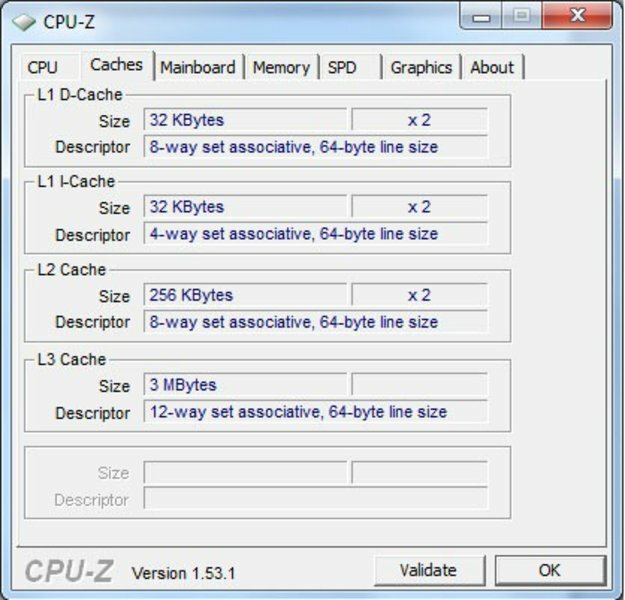 From the perspective of the technical performance, almost everything is possible with this desktop replacement. Surfing the web, office as well as multimedia use, writing emails, and to a certain extent also playing current games. 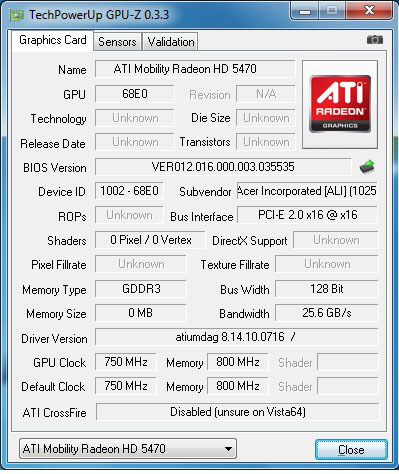 Depending on the particular game compromises in terms of the level of detail and resolutions have to be made though, since the integrated ATI Mobility Radeon HD 5470 is an entry level mainstream graphics card, and hence does not have the performance of a gaming GPU. 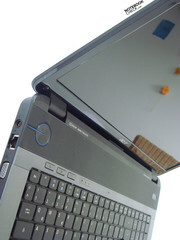 For people who rate the gaming capability as a high priority, a notebook with an ATI Mobility Radeon HD 5670 or better would be more suitable. The Aspire 7740G comes with Windows 7 Home Premium pre-installed, and has a 24 months guarantee period. The maximum opening angle is somewhat moderate, but sufficient. Most of the important interfaces are located along the left side. 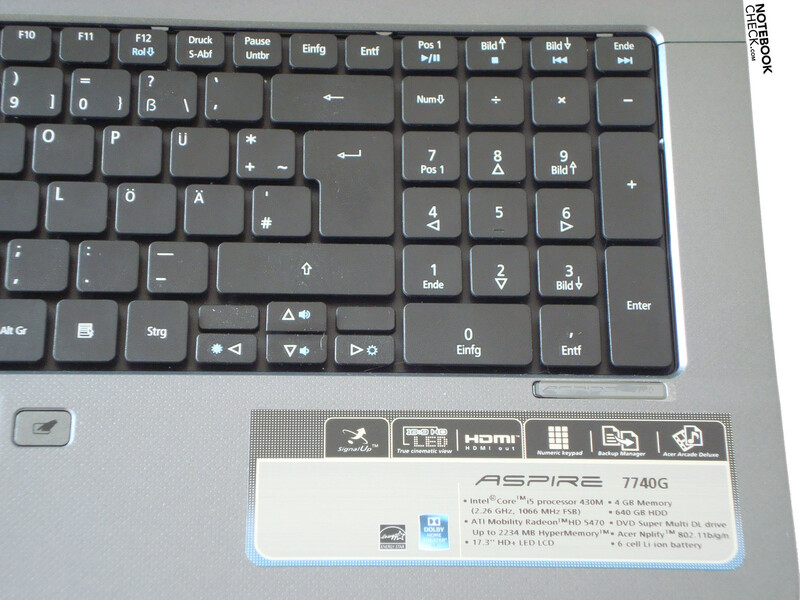 The Aspire 7740G has a complete alphanumeric keypad. 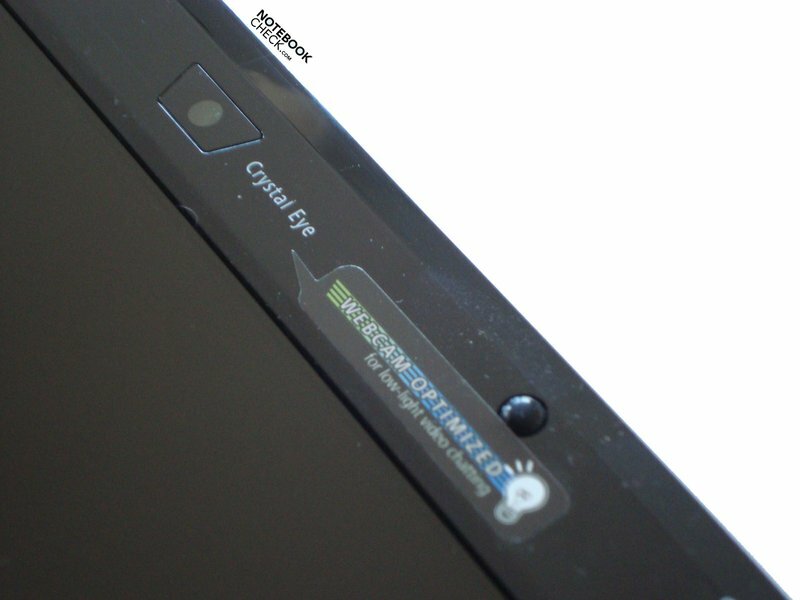 A Crystal Eye webcam along with an array microphone are also on board. Outdoor use is thus likely to be frustrating. which are both located at the edges. Tangled cables are hard to avoid. As with its little brother, the Aspire 7740G keyboard was convincingly good. Furthermore we were very pleased with the operating noise, and particularly with the operating temperature, even when operating at a high level. Possibly 3D technology? As a desktop replacement 3D technology would be much more appropriate with the 17.3 inch version, than with the 15.6 inch model. That Acer placed all the important interfaces on the left side. Possibly the shortly reviewed and from a hardware perspective slightly weaker Toshiba Satellite L550-207, or the better equipped Dell Studio 1749.